In the 1960s and '70s, a diverse range of storefronts -- including head shops, African American bookstores, feminist businesses, and organic grocers -- brought the work of the New Left, Black Power, feminism, environmentalism and other movements into the marketplace. Through shared ownership, limited growth, and democratic workplaces, these activist entrepreneurs offered alternatives to conventional profit-driven corporate business models. By the middle of the 1970s, thousands of these enterprises operated across the United States. But only a handful survive today. Some, such as Whole Foods Market, have abandoned their quest for collective political change in favor of maximizing profits. 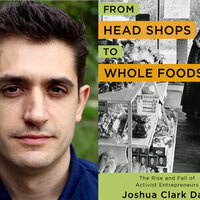 In From Head Shops to Whole Foods, Joshua Davis portrays the struggles, successes, and sacrifices of these unlikely entrepreneurs. The book challenges the widespread but mistaken idea that activism and political dissent are inherently antithetical to participation in the marketplace. Davis uncovers the historical roots of contemporary interest in ethical consumption, social enterprise, buying local, and mission-driven business. Joshua Clark Davis is assistant professor of history at the University of Baltimore. Marc Steiner, podcast host, radio host, and activist, will introduce the event.